A light drizzle washed the dust off the day last Sunday and set the stage for a great screening of BRAVO! at Casa Grande, Arizona’s historic Paramount Theatre. A hundred folks showed up and listened to music, looked at art and saw the film. The interesting thing to me about the art was that it was all performed and mostly created by veterans. I think the creation of art is a potent tool in helping veterans who suffer from PTSD and TBI to analyze and handle these war-caused maladies. The screening of BRAVO! was a benefit for the Pinal County non-profit, HOHP (Honoring/Hiring/Helping Our Heroes of Pinal County) that works to assist veterans with all types of issues: homelessness, veteran health benefits, education, housing. You can find out more about HOHP at https://hohp4heroes.org/site/home. 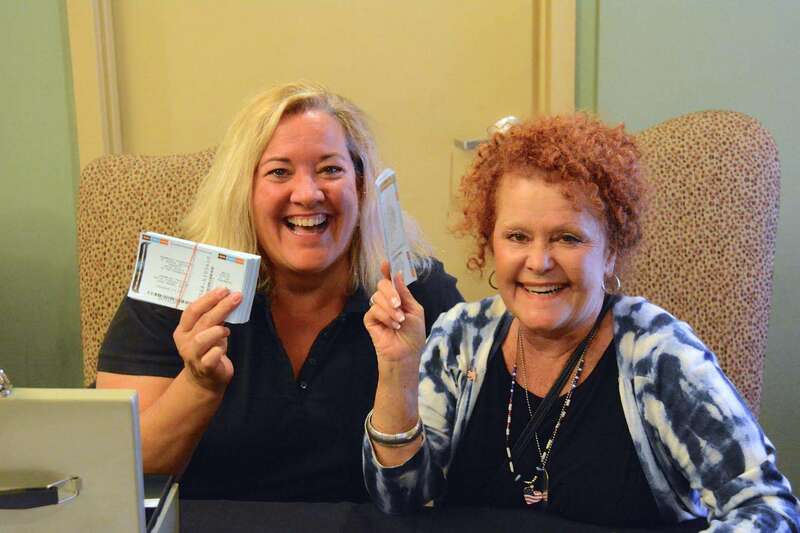 Two enthusiastic ladies selling tickets to the Casa Grande screening on 2-15-2015. The event, besides featuring music, art and film, also had silent and live auctions to raise funds for HOHP, and a lunch was served. All of the efforts spent on putting this event together and all of the items auctioned and eaten came about as a result of the fine volunteer folk of Pinal County. Joining us in Casa Grande was BRAVO! Marine, Ken Korkow, recipient of the Navy Cross for his actions on the Payback Patrol of March 30, 1968, at Khe Sanh. Ken was joined by his wife Liz and friends and members of the extended Korkow family. 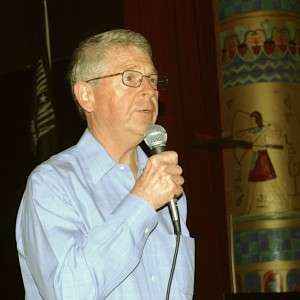 Ken talked to the folks at the screening about his efforts to help veterans with PTSD and TBI. Thanks Ken and Liz for all you do for veterans and for BRAVO! A big Oooorah! goes out to Debby Martin of the Paramount Theatre and all of her wonderful volunteers for their work in making the venue an accepting place to hold such an event. Kudos, too, to Palmer Miller, veteran’s case-worker for Arizona Congressional District One. Besides emceeing this event, Palmer, a 23-year veteran of the United States Army, was responsible for creating a lot of the art on display. We have been invited back and have worked with Debby and Palmer now on four different screenings at the Paramount and all have been a unique and big success. 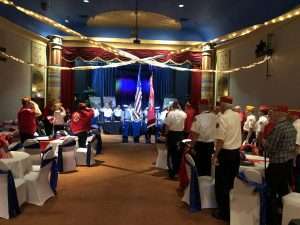 We saw a lot of old friends and made some new ones and we wish HOHP all the best in their efforts to help the veterans of Pinal County, Arizona. BRAVO! Marine Ken Korkow addressing the crowd at the 2-15-2015 screening of BRAVO! in Casa Grande, AZ. On March 30, 2015, BRAVO! will be shown at the Egyptian Theater in Boise, Idaho. Doors open at 6:00 PM. Program begins at 6:45 PM. Following the screening there will be a panel discussion moderated by Boise author extraordinaire, Alan Heathcock. The panel discussion will include veterans, some of whom are in the film. Proceeds will benefit the Idaho Veterans’ Network and Veterans’ Treatment Courts. Tickets are available online from the Egyptian Theater here at http://www.egyptiantheatre.net/event/2886/?instance_id=28. 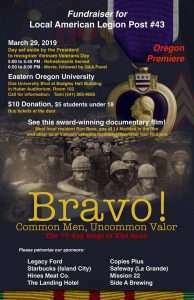 Additional Idaho screenings to support the Veterans’ Courts and the Idaho Veterans’ Network will be held at the Williams Conference Center at Lewis-Clark State College in Lewiston, Idaho, on March 27, 2015 from 6:00 PM to 9:00 PM, suggested donation of $5.00 and there will be beverages and snacks provided; Twin Falls, Idaho, on March 31, 2015; at the College of Southern Idaho’s Fine Arts Building, time yet to be determined; Caldwell, Idaho, on April 1, 2015, at College of Idaho’s Langroise Recital Hall, 6:45 PM; and in Pocatello, Idaho, at a time yet to be determined. If you or your organization would like to host a screening of BRAVO! in your town this coming spring or summer, please contact us immediately. Last night in Casa Grande, Arizona, we screened BRAVO! at the old Paramount Theatre to an enthusiastic audience approaching one-hundred attendees. Casa Grande is my hometown. As always, the mix of folks at the screening proved unique. We screened BRAVO! 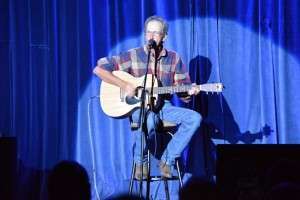 as a benefit for the Pinal County Veterans Memorial. 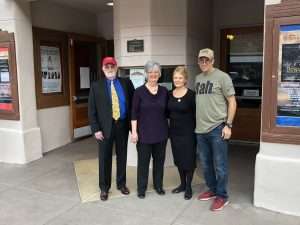 Thanks much to Debby Martin of the theater, Palmer Miller of the Memorial, and the Paramount Film Society for all their assistance in making the screening of BRAVO! possible. One of the highlights of the evening was at the end of the film, after the film credits ceased rolling. Mr. Marty Haggard, the son of Mr. Merle Haggard, sang one of his father’s songs that was popular during the Vietnam War, “The Fightin’ Side of Me.” Other highlights were the presentation of the colors by the Casa Grande Union High School Marine Corps Junior ROTC and Palmer Miller’s art. The youngest attendee was our granddaughter, Jayden Rodgers, who was there with her sister Justyce and dad, Jim. The oldest person was Sybil Wilson, ninety years young. Sybil grew up and attended school with my parents and lived behind us when I was a kid. Friends came from far away to see the film, including Sharon Haldane, in Arizona on a visit from Oklahoma. I was standing outside the theater talking to long-time friends Anita and Al Chew when a man walked by me whom I recognized, but from a completely different context. I thought, that looks like Alex Dominguez from Norwalk, California. 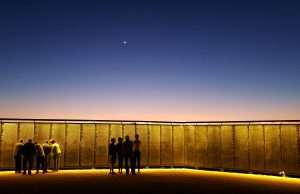 (Alex is a Khe Sanh Veteran brother.) And he stopped and we shook hands and it was Alex who told me later that he’d come over to support me because Casa Grande is my hometown. Now that’s what I call having your brother’s back. Thanks to all the folks who came to the screening and thanks for all the support. On another note, February in 1968 at Khe Sanh was a dire time for American forces trapped inside the enemy’s encirclement. There was the attack on Hill 861A and the fall of Lang Vei and the bitter struggle between the Marines of 1/9 and the NVA over Hill 64. Later came the Ghost Patrol and every day the incoming was fierce, driving us deeper into bunkers and trenches and deeper into ourselves. The events of February 1968, if we survived it, forced us to find out what kind of mettle we could muster. In the face of death, we were forced to perform, forced to go on. I suppose these vicissitudes of war and how we cope with them are part of the undefinables that embody the concept of courage. Besides finding “courage,” being in Vietnam during 1968 forced us to discover many things about life and death. I recently got my hands on and read a book of poems by Marine and BRAVO! supporter Barry Hart titled, A PATH INTO THE WOODS. Barry’s son, Nathan, wrote a moving and perceptive forward for the book in which he talks about, among other things, how he saw his father’s attempts to cope with the experience of the war. There is a lot of good poetry in this book, both about war, and not about war, poetry about family, loss, self-improvement. There are poems in free verse and there are more formal pieces with rhyme and meter. Barry Hart knows how to write poetry, has a sense of sound and imagery, understands the concepts of metaphor and other aspects of figurative writing. “The impression of death,” a visual thing shaped by their dead bodies, but more than that, an impression that hits us hard as the words come back to us as we drive down the road or walk the dogs; later, after we have read this poem, that impression comes back. For more information on Barry’s book, A PATH INTO THE WOODS (Periploi Press, Nashville, TN), go to http://www.hartbn.com. On the screening front, BRAVO! will be shown at the Fallbrook, CA, VFW Post 1924 on March 22, 2014 at 2:00 PM in the afternoon. Tickets for the screening are $10.00 and can be purchased at the door, first come, first served. Proceeds from this screening will go to benefit American Combat Veterans of War, a 501(c)(3) non-profit organization that assists combat veterans with finding their way back into productive lives. We will be screening the film to 300 veteran residents in a private affair at the California Department of Corrections and Rehabilitation facility at San Quentin on March 29, 2014. The following day at 6:00 PM we will screen BRAVO! aboard the SS Jeremiah O’Brien at Pier 45, Fisherman’s Wharf, San Francisco, CA. If you are in the area, please consider coming to see us and the film. Net proceeds from this screening will go to help fund the SS Jeremiah O’Brien Dry Dock Fund. The SS Jeremiah O’Brien, The National Liberty Ship Memorial, is a 501(c)(3) non-profit entity. 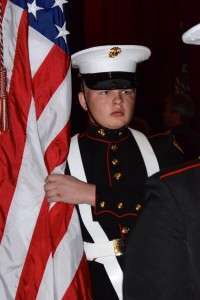 For more information, go to http://www.ssjeremiahobrien.org/.